For other people named Paul Douglas, see Paul Douglas (disambiguation). 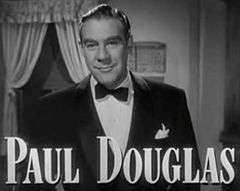 Paul Douglas (April 11, 1907 − September 11, 1959) was an American actor. Douglas was born Paul Douglas Fleischer in Philadelphia, Pennsylvania, the son of Margaret (Douglas) and William Paul Fleischer. He attended Yale University and participated in dramatics as a student there. Douglas worked originally as an announcer for CBS radio station WCAU in that Philadelphia, relocating to network headquarters in New York in 1934. Douglas co-hosted CBS's popular swing music program, The Saturday Night Swing Club, from 1936 to 1939. He made his Broadway debut in 1936 as the Radio Announcer in Doty Hobart and Tom McKnight's Double Dummy at the John Golden Theatre. In 1946 he won both a Theatre World Award and a Clarence Derwent Award for his portrayal of Harry Brock in Garson Kanin's Born Yesterday. Douglas began appearing in films in 1949. He may be best remembered for two baseball comedy movies, It Happens Every Spring (1949) and Angels in the Outfield (1951). He also played Richard Widmark's police partner in the 1950 thriller Panic in the Streets, frustrated newlywed Porter Hollingsway in A Letter to Three Wives (1949), Sgt. Kowalski in The Big Lift (1950), businessman Josiah Walter Dudley in Executive Suite (1954) and a con man turned monk in When in Rome (1952). Douglas was host of the 22nd annual Academy Awards in March 1950. Continuing in radio, he was the announcer for The Ed Wynn Show, and the first host of NBC Radio's The Horn & Hardart Children's Hour. In April 1959 Douglas appeared on The Lucille Ball-Desi Arnaz Show as Lucy Ricardo's television morning show co-host in the episode "Lucy Wants a Career". In 1955 he appeared in the play "The Caine Mutiny" but was suspended by his union when he made comments that offended southern audiences about segregation. Douglas was originally cast in the 1960 episode of The Twilight Zone called "The Mighty Casey", a role written for him by Rod Serling based on his character in Angels in the Outfield. Douglas died the day after production of the episode had been completed. He had been in his last stages of illness during filming, and his severe physical state was apparent on film. (The crew incorrectly assumed that his condition was the result of heavy drinking.) The episode – which was a comedy – was deemed unairable. It was, however, resurrected some months later, and Douglas's scenes were re-shot with Jack Warden. Douglas was married five times—to Elizabeth Farnum, Susie Wells, and Gerri Higgins, and to actresses Virginia Field and Jan Sterling. Douglas and Field had a daughter, Margaret. The couple divorced in 1946. He married Sterling on May 12, 1950. They had a son, Adams, born October 20, 1955. Paul Douglas died of a heart attack at his home in Hollywood, California on September 11, 1959, at the age of 52. He had just finished filming scenes from a Twilight Zone episode called "The Mighty Casey". As with Angels in the Outfield, he played a manager frustrated by a losing team. Most of his scenes were re-shot with Jack Warden as the manager. Film director Billy Wilder and his longtime co-writer I. A. L. ('Izzy') Diamond had just offered him the role of Jeff Sheldrake in the 1960 movie The Apartment that went to Fred MacMurray instead. Wilder later said: "I saw him and his wife, Jan Sterling, at a restaurant, and I realized he was perfect, and I asked him right there in the parking lot. About two days before we were to start, he had a heart attack and died. Iz and I were shattered." 1 2 3 "Paul Douglas, Actor, Dies". Idaho State Journal. September 11, 1959. p. 1. Retrieved May 23, 2015 – via Newspapers.com. 1 2 "About Douglas and New Wife". The Spokesman-Review. June 4, 1950. Retrieved 26 May 2015. ↑ Katz, Ephraim (1979). The Film Encyclopedia: The Most Comprehensive Encyclopedia of World Cinema in a Single Volume. Perigee Books. ISBN 0-399-50601-2. Pp. 355-356. ↑ "Actor Paul Douglas Takes Fifth Bride in L.A. Court". The San Bernardino County Sun. May 13, 1950. p. 1. Retrieved May 23, 2015 – via Newspapers.com. ↑ "Better Radio Programs for the Week". The Decatur Daily Review. March 9, 1952. p. 42. Retrieved May 23, 2015 – via Newspapers.com. ↑ Kirby, Walter (February 22, 1953). "Better Radio Programs for the Week". The Decatur Daily Review. p. 40. Retrieved June 23, 2015 – via Newspapers.com. Wikimedia Commons has media related to Paul Douglas (actor).